Following the immense success of the Inno Pocket Spot, ADJ is pleased to introduce its next generation affordable and compact moving head, the Pocket Pro. 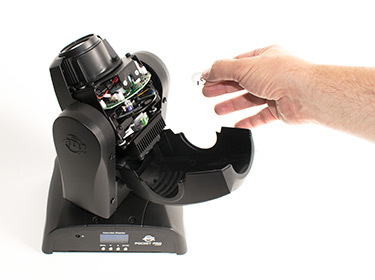 Offering all the same features as its predecessor, this innovative new fixture adds the flexibility of replaceable GOBOs, 4 additional GOBOs, a powerCON input and also offers brighter output, but without an increase in retail price. Powered by a potent 25W white-light LED (increased from 12W on the Inno Pocket Spot), the new Pocket Pro produces a vibrant beam which is equally suited to creating mid-air effects as it is to projecting GOBO patterns onto walls, ceilings, dancefloors, and stages. The fixture has a 15-degree beam angle and is fitted with a manually-adjustable lens which can be used to alter the focus of the beam to suit different projection distances. Independent color and GOBO wheels provide users with complete creative control over the unit’s output. The color wheel is loaded with seven vibrant options – red, orange, yellow, green, UV Purple, Blue, and Pink – plus open white. Meanwhile the separate GOBO wheel features seven slots filled with detailed metal GOBOs, some of which are ideal for pattern projection while others are suited to generating mid-air beams. Further adding to the flexibility of the Pocket Pro, each of the GOBO patterns is also replaceable. The unit’s casing has a hinged design which means that the top cover can easily be removed to provide access to the GOBO wheel. Individual GOBOs then simply slide out, allowing alternative patterns and custom GOBOs to be inserted in their place. As standard, the fixture is supplied with a set of four alternative metal GOBOs. These include a useful pattern featuring multiple stars of varying sizes, as well as one that depicts a pair of rings surrounded by the outline of a heart which is ideal for use at wedding celebrations. 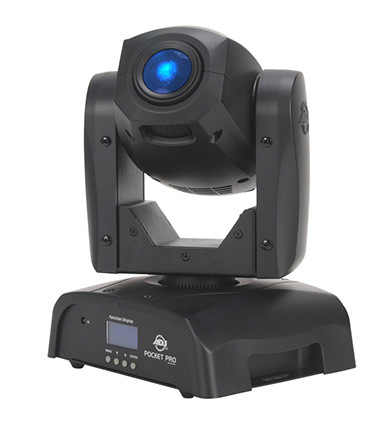 Not only is the Pocket Pro an extremely versatile fixture it is also a very agile mover. It is able to shoot through its wide 540-degree pan and 230-degree tilt angles at speed, but – thanks to micro-stepping motors – is also capable of smooth slow sweeps and precisely positioned static projections. The unit’s expansive feature set is completed by 0-100% digital dimming – with five selectable curves (Standard, Stage, TV, Architectural & Theatre), GOBO shake, variable speed digital strobing, and random slow to fast pulse effects. The fixture offers a choice of three operating modes: DMX, Sound Active, and Internal Show. It is supplied pre-programmed with four exciting built-in lightshows, which means that it can be used without the need for a separate controller or any programming skills. Multiple fixtures can also be linked using XLR cables for Master/Slave operation while extra interest can be added to a multi-head system by using the Pan or Tilt Inversion modes to cause some heads to move in the opposite direction to others when linked together. Simple wireless control of one or more fixtures can be achieved using either ADJ’s UC IR remote control or Airstream IR iOS device infrared adaptor (both sold separately). For full control over the unit’s movement and output it is also compatible with DMX with a choice of two different channel modes: 11 or 13. The Pocket Pro has an upgraded powerCON power input, as opposed to the Inno Pocket Spots IEC input, that locks into place. So, there’s no need to worry about the fixture being unplugged whether it’s used in a fixed installation or temporary, mobile application. Just like the Inno Pocket Spot before it, the new Pocket Pro is extremely compact. Measuring 6.37” x 7.87” x 11.30” / 162 x 200 x 287mm (L x W x H) the fixture is ideal for installation in venues with low ceilings and also for use by mobile entertainers and DJs who have limited transportation and storage space. Despite its robust build quality the fan-cooled fixture is also lightweight at just 7.3 lbs. / 3.6 kgs. The versatile fixture is fitted with rubber feet and also supplied with a removable Omega bracket meaning that it can be placed directly onto a stage/riser or rigged to a truss or podium. With its rich feature-set – including replaceable GOBOs – and bright output, the Pocket Pro sets a new standard for compact moving head fixtures. Ideal for use by mobile DJs and entertainers as well as for installation in smaller bars, clubs, lounges, roller rinks, bowling alleys, and entertainment centers, it offers an unbeatable combination of power, versatility, and affordability. The Pocket Pro is available now from ADJ USA; September 2017 from ADJ Europe.